Does anyone use the Vim HJKL cursor keys? How do you move the cursor in Vim? I use the arrow keys. I don't use Vim, but I like answering polls. Re: Does anyone use the Vim HJKL cursor keys? Iranon wrote: Strangely, the world doesn't revolve around you. I was making a general point. HJKL on Dvorak is using a crutch you no longer need as a dinner fork. Your point remains strangely elusive. Reading your posts is a waterfall of iron when all you wanted is a hamburger. Plain version: HJKL (actual keys, not corresponding home row positions) on Dvorak keyboards is an obvious artifact, the software was written for QUERTY. There ought to be something more economical, intuitive, ergonomical. May require some shuffling around of controls and start as a bit of a hassle, but someone who bothered to learn a little-used keyboard layout shouldn't mind. Ditching a dodgy legacy keyboard layout, just to use dodgy legacy controls makes little sense to me. I suppose the Dvorak user could go use DHTN as cursor keys, but that would mean remapping the 'delete', 'to' and 'next' commands to something less mnemonic (either J, K and L or be ready to do a hell of a lot of reshuffling). I repeat my question as to whether there's solid evidence that Dvorak is dramatically better than QWERTY. HJKL is neither here nor there: a slightly more efficient way of using an utterly inefficient keyboard layout. Seems to indicate that the difference between the arrow keys and hjkl is minimal. I heartily disagree. You can have your keyboard layout argument elsewhere if you want to, but your quote seemed and still seems silly to me. And it's really pretty instinctual now that I'm used to it. To the point where if I'm on a QWERTY keyboard and typing text okay, I'll still go to the dvorak location for the Vim commands unintentionally. j feels like the most sensible place for it because I'm used to it. And you had to resort to uncouth shouting because you don't grasp obvious relevance to the argument at hand or hold more than 1 thought at once? Anything you've done for long enough becomes second nature. Doesn't mean it's elegant or efficient. Also, I've had it with being asked to elaborate, then yelled at when I do. Cursor keys easily accessible from the typing position are preferable for the kind of programs we're considering here, if it can be done without kludges. Ended wrote: Oh, I definitely agree hjkl is more efficient than the arrow keys. I just think that its importance tends to be overstated compared to vim's other motion commands. Like, the editing speed you will lose by not using w/e/t/f or whatever is as much, and probably more, than you will lose by not using hjkl. Oh, absolutely. The vi movement commands are awesome, and the reason for my vim-envy. I've been meaning to switch to evil-mode for ages for that reason. I wouldn't want to use vim as my primary editor (I think emacs is more powerful and more easily configurable - although admittedly somewhat bloated), but for actual text editing, vi's commands are the best I've used. Partly due to modal editing, but mostly because having a coherent "grammar" of movement/editing commands gives a combinatorial increase in power. Iranon wrote: QUERTY keyboards are arranged to prevent jamming of early mechanical typewriters, which was easily caused by neighbouring arms being depressed in rapid succession. It has as a lot of hand-alternating sequences in English by design which is at odds with comfort and accuracy at speed. I've heard many times that this is a myth, and I've never seen any evidence that it's true, so I'm forced to dismiss it. Iranon wrote: The original design constraints no longer apply. If you care enough about efficiency to do something nerdy about it, picking a sensible keyboard layout would be a better start. The keyboard layout isn't really the issue here. The keys were obviously chosen for their position, not for the letters on them. If you use Dvorak, you could still use the home row keys, although you'd have to move everthing else around (I guess if you wanted to keep all the positions the same, you could do it programmatically). Alternatively, you could learn the new positions: they'd be slightly slower than the home row positions, but still way faster than the arrow keys, and you'd be able to use an unmodified vim configuration. The home row keys are efficient, but the *main* benefit of hjkl in vim is simply that they're on the main keyboard. ahammel wrote: Well, now that we're on the topic of keyboard design, I've been wondering if Randal was correct about this. Is there any solid evidence that Dvorak (or some other layout) is that much better than QWERTY? I think he is mostly right. There seems to be no actual historical evidence for most of the stories that are floating around (or if there is, I've never seen it produced). Most Dvorak users claim relief of RSI symptoms, some claim faster typing speeds. Studies by Dvorak and supporters found it was faster, but these were not impartial studies. A US government study by Strong in 1956 found it wasn't faster, but has been claimed to be biased in favour of QWERTY. There really doesn't seem to be any high quality, replicated studies to go on. Based on aggregated anecdotal evidence, I'm willing to believe Dvorak is more ergonomic (of course, there are other layouts based on more recent ergonomic studies, which may be better). It may or may not be a bit faster. Iranon wrote: Cursor keys easily accessible from the typing position are preferable for the kind of programs we're considering here, if it can be done without kludges. If we could get all programs to agree on keyboard shortcuts, we wouldn't need it. But since we can't, easily accessible cursor keys would be nice. Most keyboards have unused room below the keyboard that would be incredibly convenient for thumb keys. Keyboard makers could put cursor keys there. Or better yet, new modifier keys that give cursor keys in combination with home row keys. You could do it in software if you had a free key, but then you lose a key you could be using as a modifier. One possibility is if you swap CapsLock and Control, instead of using the original Ctrl as CapsLock, use something like xbindkeys to make it give CapsLock in combination with "c", arrow keys in combination with "hjkl" (or whatever), etc. Then you'd have lots of spare combinations available that wouldn't conflict with anything. It'd mean running a daemon constantly, but that's not a big deal. Actually, I like this idea. Maybe I should do it. I only use the left Ctrl key as Escape now, and I can usually use Ctrl-[ for that. I only really need it for cancelling dialog boxes and stuff, and the standard Escape key should be okay for that. So I decided that 99% of this post is off-topic so I'm spoilering it. I don't think it is -- I suspect you're conflating two related but different statements. One thing I've heard from Dvorak proponents (disclaimer: I am one ) is that QWERTY was deliberately designed to slow down typing to avoid mechanical jamming. This is what I've heard is a myth a lot -- but it's usually supplanted by the above as the "actual" explanation. That is, character sequences that are likely to occur are placed far apart to avoid jamming. However, it's not really true that this when taken alone means that QWERTY will be slower. In fact, hand-alternating sequences are actually a desirable characteristic of layouts, and one that Dvorak probably does better! Iranon wrote: Alternatively, you could learn the new positions: they'd be slightly slower than the home row positions, but still way faster than the arrow keys, and you'd be able to use an unmodified vim configuration. The home row keys are efficient, but the *main* benefit of hjkl in vim is simply that they're on the main keyboard. My objection to that (though I'm not a Vi-er) is that there are a lot of times when I'll just take one hand off the keyboard entirely, e.g. if I'm just scrolling through the document looking around. Neither Emacs nor Dvorak vi have all movement keys reachable by either hand in their home positions. Actually now I kind of want to videotape my hands when typing so I can see what I do. It'd also be interesting to know what the switch time is between home keys and arrow keys, and home keys and backspace. Well, now that we're on the topic of keyboard design, I've been wondering if Randal was correct about this. Is there any solid evidence that Dvorak (or some other layout) is that much better than QWERTY? That's about my impression to. I'm inclined to believe it's a little faster too, but not a lot faster. Personally, I learned Dvorak in the aftermath of some relatively debilitating wrist problems I had many years ago. I figured that, even if there wasn't convincing evidence that it was actually better, I don't think I've ever heard anyone provide any substantive claim at all that it is worse from an RSI perspective. So "may be a fair bit better, probably isn't worse" was a good enough reason for me. Most keyboards have unused room below the keyboard that would be incredibly convenient for thumb keys. Keyboard makers could put cursor keys there. So personally, I don't think this would work well for me... I use (and love, mostly) the MS Natural 4000, and below the keyboard is a rest I use for my palms. There's not much space there that's conveniently reachable to be honest for me. What I'd love to see is foot-pedal-activated modifiers. EvanED wrote: So I decided that 99% of this post is off-topic so I'm spoilering it. Well, it's a bit late for me, but I guess I'll follow your lead. I was responding to the first sentence in that quote of Iranon's (I should have cut the second one out, sorry), that "QUERTY keyboards are arranged to prevent jamming of early mechanical typewriters" and implictly that such design involved limiting typing speed. I forgot to respond to the second sentence, which confused me a bit. As you say, Dvorak has more hand alternation, which is meant to be desirable. One-hand shortcuts are certainly useful. I think how important they are in a text editor is going to vary a lot by person, though. If I was a Dvorak vim user, I think I'd just remap all the keybindings to their Dvorak-equivalent-position keys. You'd lose the mnemonic convenience of some keybindings, but that's not a huge deal (and if you've already committed them to muscle memory, it's not even important). btw, I notice you say "in the home position". If you're scrolling around or whatever with one hand, there's no reason your hand needs to be in the home position, is there? I know when I'm keyboard-controlling an application with one hand, I often end up with the hand in highly abnormal positions. I'm not saying you couldn't do anything, but it'd take some effort to re-map everything, and would make it harder for at least me to learn it. I know; what I'm saying is that I think the first part (but not the implication) is actually true. (Just that the mechanism for doing so isn't the "it was designed to deliberately slow down typists" which I've heard to promote Dvorak.) I can't claim to be an expert in the area, but I don't remember ever reading any sources claiming that part (that QWERTY was designed in part to reduce jamming) is false. Yeah, that's been what I've seen too. Haven't looked too much, but I've occasionally done a search. EvanED wrote: I know; what I'm saying is that I think the first part (but not the implication) is actually true. (Just that the mechanism for doing so isn't the "it was designed to deliberately slow down typists" which I've heard to promote Dvorak.) I can't claim to be an expert in the area, but I don't remember ever reading any sources claiming that part (that QWERTY was designed in part to reduce jamming) is false. Oh, okay. I was pretty confident that that implication was implicit in Iranon's statement, so that's what I was responding to. As far as the keyboard being designed to prevent jamming...well, it's definitely true that the arrangement of the typebars was designed to prevent jamming. I'm not sure to what degree that would constrain keyboard layout. How do you reckon that modal editing is faster than chording? Chording simply allows you to enter more information (in bits) in less time, and is far more intuitive to boot. In fact, the fastest typing speeds are achieved not using a keyboard at all, but a device that basically is like a piano with just a couple keys for each finger, and everything is chorded (extensive shorthand is also used to increase speed, but these are separable features). This is how real-time captioning can be done. It's probably very difficult to learn, but I think that provides pretty good evidence that using modifiers for commands is faster than switching modes for the same commands. That space is mostly reserve for resting your wrist already, and even if you did put keys there I'm sure it would result in a lot of accidental presses. When I'm typing on a laptop with a trackpad in that area, and tap to click is on, I'll be constantly producing accidental clicks (which can sometimes move the cursor, which is incredibly frustrating). How do you reckon that modal editing is faster than chording? Chording simply allows you to enter more information (in bits) in less time, and is far more intuitive to boot. When I said "faster than using modifier keys", I was referring to the keybindings used in Emacs and other nonmodal editors. I didn't mean to imply that using single keys was faster in the theoretical limit than key chording. Of course you could achieve massive speeds in theory (depending on your keyboard's rollover) by chording. And yes, steganography is cool. But emacs et al don't use this theoretical abundance of combinations. They just modify keys with one (occasionally two) modifiers because the unmodified keys are used to insert the corresponding glyph and thus unavailable for editing. Also, note that modal editing does not preclude chording. It just doesn't *require* it, and so it's not used for the common commands. Less common commands will still use modifiers. The essence of modal editing is switching between contexts (ie. modes) which have different purposes and different keybindings. That space is mostly reserve for resting your wrist already, and even if you did put keys there I'm sure it would result in a lot of accidental presses. I meant a desktop keyboard. Come to think of it, though, you *could* put them on most laptops, above the trackpad. A thinkpad has the trackpoint buttons there, which are quite convenient. Other brands don't have trackpoints, so they could put cursor keys there instead (they'd be considerably smaller than the trackpad buttons). When I'm typing on a laptop with a trackpad in that area, and tap to click is on, I'll be constantly producing accidental clicks (which can sometimes move the cursor, which is incredibly frustrating). I know. It helps to have a trackpad-locking widget in your taskbar. But the trackpad's further down. I use a thinkpad that actually has trackpoint buttons right below the keyboard, and I never press (or even brush) them by accident. troyp wrote: When I said "faster than using modifier keys", I was referring to the keybindings used in Emacs and other nonmodal editors. I didn't mean to imply that using single keys was faster in the theoretical limit than key chording. Of course you could achieve massive speeds in theory (depending on your keyboard's rollover) by chording. And yes, steganography is cool. But emacs et al don't use this theoretical abundance of combinations. They just modify keys with one (occasionally two) modifiers because the unmodified keys are used to insert the corresponding glyph and thus unavailable for editing. I'm also thinking about desktop keyboards. The same space is still used for resting your wrist. You are talking about below the spacebar, right? Derek wrote: I'm also thinking about desktop keyboards. The same space is still used for resting your wrist. You are talking about below the spacebar, right? Yeah. More ergonomic keyboards often have wrist-rests, but there'd still be room for a few keys in the centre. eg. the MS Natural 7000 has a couple of keys in that position (not sure what they are). Even keyboards with a removable wrist rest could have a cut-away section in the centre. Of course, there's going to be some keyboards where you couldn't fit them, but on most you could. And I'm not convinced that you need the keys to always be dedicated to inserting glyphs into a document. It seems like you always do that in short bursts when writing code, so why force chording for even the most basic commands? That seems inefficient. Chording as currently implemented in all the common editiors (emacs, vi, etc) is actually not even chording IMHO, it's multi-key commands that are awkward because for some reason you have to hold on to one key while you hit the next one. I have several commands that I've written to do common tasks (window resizing since I use gVim in windows, source control keybindings to open files for edit in perforce) that start with Tab. But you don't need to hold tab down. Tab then '>' will increase the gVim width in windows, by default by 50%, but if given a number, eg "20<TAB>\>", it will widen by that number of characters. And vim actually has a bunch of built-in commands that act like this as well, eg gP, gf, das, etc. I might be a bit late, but maybe someone finds this useful for Vi use or dvorak in general. When I press Caps Lock down, all the navigation keys appear under my right hand. I also have backspace and delete mapped next to my index finger. Since I'm a dvorak user, my left hand also has ctrl+a, x, c and v (select all and copy/paste) on the home row this way. With Vim this solves pretty much all the issues people have mentioned in this thread: the incompatibility with the dvorak layout, providing a real arrow key layout instead of a row, and working in both edit and navigation modes. I guess vim with dvorak still is an issue for other users, since googling it results in pretty incomplete discussion. The same can be done on Linux with xmodmap or creating a custom xkb layout. xmodmap, for example, "keycode 44 = h H Left Left" and "keycode 66 = Mode_switch NoSymbol Mode_switch" to make caps activate the alternative action. plilq wrote: I Since I'm a dvorak user, my left hand also has ctrl+a, x, c and v (select all and copy/paste) on the home row this way. Ctrl+A is for adding one to the next number after the cursor. Ctrl+X is to subtract one from the next number after the curser. Everyone knows what Ctrl+C is and it has nothing to do with copy/paste. Ctrl+V is for visual block mode. I use all of these in my editing, especially Ctrl+A for setting up enumeration constants. Well, I don't really use Ctrl+C that much. I did not mean Vim when I mentioned those, since like I said, it's for general use and every other program uses them for copy/paste. It's not like it removes the functionality you mentioned or anything, since Caps+U just becomes an alias for Ctrl+V -- and Ctrl+V still works like it usually does. Usually copy/paste on dvorak with one hand is somewhat a strain since X, C and V are not in very easy positions. Caps lock is permanently mapped to left ctrl and left ctrl is permanently mapped to caps lock on my computer. I like this and would not go back. But that does sound cool for you. I do but after 3 months of continuous use or trying to use naturally I will be moving to WASD but I think that shall create another problem of moving WASD's actions to somewhere else. Hell, maybe I shall come back to arrow keys itself if I do not find proper alternative to accommodate WASD. Though MacVim provides a good balance. amar wrote: I do but after 3 months of continuous use or trying to use naturally I will be moving to WASD but I think that shall create another problem of moving WASD's actions to somewhere else. Hell, maybe I shall come back to arrow keys itself if I do not find proper alternative to accommodate WASD. ...what? Why are you wanting to change it? I use JKLI. The two main benefits are that you don't use pinky finger repetitively, and the layout of JKLI makes intuitive sense as to what each key does. 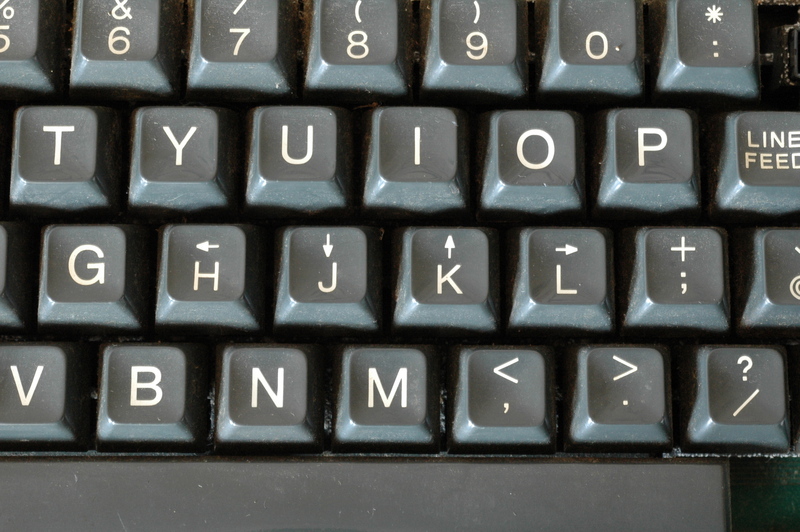 HJKL keys used as arrow keys in ADM-3A terminal, it has arrows on HJKL keys. John Wilson wrote: I use JKLI. The two main benefits are that you don't use pinky finger repetitively, and the layout of JKLI makes intuitive sense as to what each key does. Than what do you use for i, h? After playing nethack on laptops without a number pad, I still prefer using the arrow keys. I'm currently using jkli (the default that comes with colemak-evil), with u,o for backward/forward word. It's nicely geometric, and I think in the same efficiency-ballpark as hjkl, considering that either one requires a slight stretch to hit one of the buttons. jkl; would be another story, but I think that would put too much strain on the pinkie. What's bizarre is that my altgr layout uses arsw, which is blatantly less efficient in vi-like editors but required when pressing altgr for ergonomic/space scarcity reasons. (To use it, I shift one to the left, putting the stronger three fingers on it and giving me access to ctrl as well.) So I have to switch back and forth. bug sniper wrote: After playing nethack on laptops without a number pad, I still prefer using the arrow keys. I just learned to play with the number row. My laptop has a numpad now, but I think I could still play with the number row quite naturally if I needed to. EvanED wrote: My objection to that (though I'm not a Vi-er) is that there are a lot of times when I'll just take one hand off the keyboard entirely, e.g. if I'm just scrolling through the document looking around. Neither Emacs nor Dvorak vi have all movement keys reachable by either hand in their home positions. [colemak.vim/colemak-evil]-inspired vim/evil mappings have this property. They remind me of gaming hand positions which, let's face it, are a lot better-known than hjkl. I've since adopted a similar style for web-browsing, reading, vlc as well, only one hand required. | | | | Paste-Pop | | | | | | | · = char arg. | Redo | Cut To EOL| Copy Line | <-Paste | Find File | ? <-Find§ |RpetFndBkwd| Set Mk· | < ◀-Dedent| > Indent-▶| > = move arg. Some of it requires modifiers, but even without any, you can arrow keys, move by words, or page up/down. Of course, navigation has completely different priorities for web browsers/readers (minimal side movement, much emphasis on moving up/down by a lot), so for those I set n/i to be page up/down, l/y as back/forward, and h/o to navigate tabs. I spend most of my text editing telnetting into SCO 5.0.7 boxes with vt220 term type so the arrow keys don't work for me anyway. zenten wrote: I spend most of my text editing telnetting into SCO 5.0.7 boxes with vt220 term type so the arrow keys don't work for me anyway. Well, the port to Linux should be done soon (already at the point that I can play with it), but I don't think the vt220 term emulation (too many custom utilities in this company need the "Do key" and whatnot) is going away anytime soon. Arguments regarding keyboard layouts are outside the scope of the original question and have little meaning, likely most of those who have moved to an alternative layout are using different keys or have adjusted fine. Incidentally you can probably type faster than you can produce good prose or good code anyway. Arguments in favor of chording as a more effecient way to edit text are both out of scope and wrong. Firstly you can once again pound the keyboard faster than you can produce good prose or code so the ability to enter more key combinations faster is meaningless. Strings of normal mode commands like daw(delete around word) or daf (delete around function) will always be more meaningful and easily memorable than Control this , alt that, control this and easier to type due to the relatively awkward placement of the modifier keys compared to the letter keys and the need to hold one down and hit another. Arguments in favor of using the arrow keys ignore just how inefficient it is to take the right hand all the way off the keys. Personally I use pentadactyl for firefox, zathura to read pdf files, and vim to edit text, and i3wm with xcape set up to generate a different key when either shift is pressed rather than held down. In no case that I could imagine it being terribly efficient to reach for the arrow keys. I am working on a way to get "one-handed" navigation with a Vim-optimized programmer dvorak layout. Do you have any modifications you would recommend to the following layout? Do you know whether this would cause any problems with a VIM layout? Both arrow keys and HJKL are not very efficient. Keeping your fingers in the home position is best! Also these schemes work in ANY editor, not just vi. As this is necroed, I've used side-cursors, numpad cursors, ASDW, ADWX, JKLI1, +-*/, HKUM, and many more, depending on the one(s2) the game/utility/UI ended up supporting... I mostly was an Emacs person, but my Nethack days contributed to my acceptance of vi-like control. There's none of these that are 'inefficient', IMO. You can get used to any layout (see also QWOP), with practice. 1 Or similar RHS versions of ASDW for the use of player 2 in two-person-one-computer games. 2 See Dwarf Fortress, where various different 'cursorings' are employed. To me, they're logically delineated (and almost always indicated upon screen where 'odd'! ), but I hear many complaints from others.